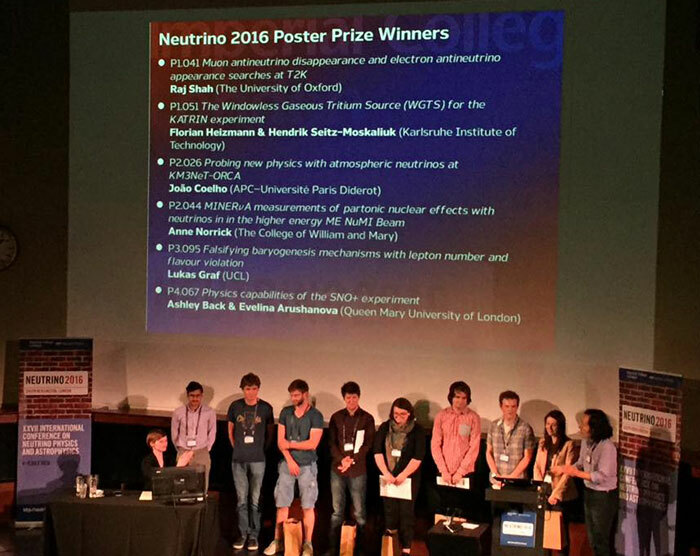 14/10/2016 - Neutrino scale KATRIN celebrated its "First Light"! As the most precise scale in the world, the KATRIN experiment aims to determine the exact mass of the smallest particle in the universe, the so-called neutrino, the exact same one which has been awarded the Nobel Prize in Physics last year. An important step on the way to measuring the neutrino mass is the "First Light", i.e. when the detector first sees electrons that have passed through the entire 70-meter-long KATRIN line. The final preparations of the KATRIN kick-off began at 15:30, with introductory words by Prof. Guido Drexlin - KATRIN spokesperson, Prof. Oliver Kraft - KIT vice-president, Prof. Ernst Otten - one of KATRIN founding fathers, Prof. Blümer - head of division Physics and Mathematics at KIT, and Professor Hamish Robertson - head of the KATRIN group at the University Washington. At 15:50, it was finally time: all speakers pressed on the "red button" to start the electron source, which delivered with great applause the expected signal of the "First Light", as seen on the monitoring screen below. Neutrinos play an important role in the investigation of the origin of matter and in the design of the visible structures in the cosmos. Their mass, which must be more than a billion times smaller than that of a hydrogen atom, is an important but still imprecisely determined parameter. 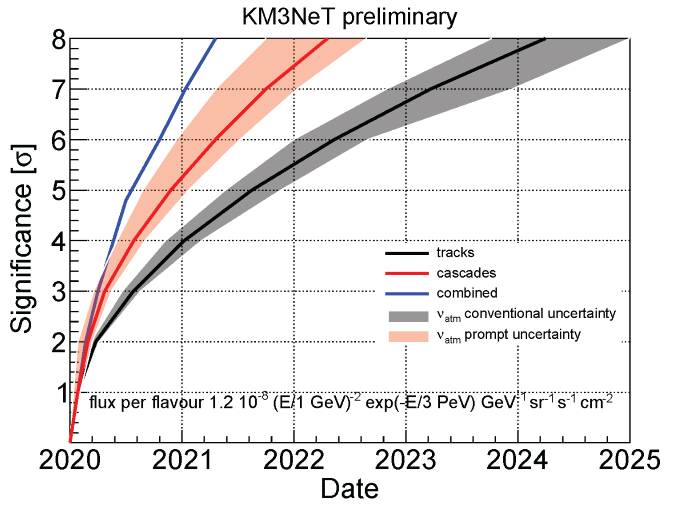 The international KATRIN experiment will put limit on the neutrino mass with an accuracy that is more than a whole order of magnitude better than before. But neutrinos cannot be directly measured as they interact very little with matter. The trick is to use the well-known beta decay from Tritium for which both neutrinos and electrons are created. These electrons will be precisely measured and will give information on the "missing" non-measurable neutrinos. The measurement campaign will start in Fall 2017. Even if the "First Light" does not yet provide its full performance, this first beam is an important working test for the scientists and engineers. The KATRIN experiment is an assembly of numerous components and for the first time they are working together. On the 70-meter-long path of an electron through the entire experiment are superconducting magnets and cold traps, gas-filled areas and vacuum, zones with temperatures below 4 Kelvin and room temperature, each of them has to be carefully operated. For the "First Light", a switchable electron source is used, which uses a UV light source to strike suitable electrons from a gold-coated stainless steel plate, which strike the detector after a flying time of a few millions of a second. 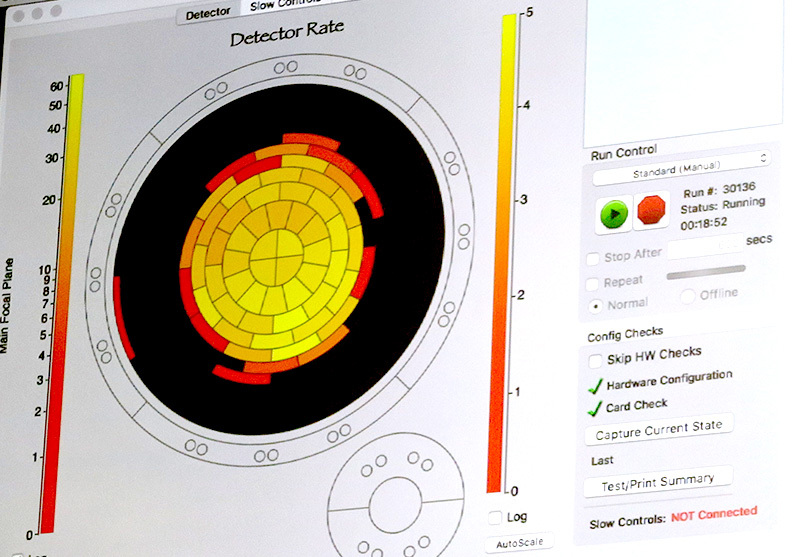 The detector of silicon semiconductor material has a diameter of around 125 millimetres and contains 148 pixels which are arranged similarly to a dartboard, thus providing a spatial "look" into the world of KATRIN. 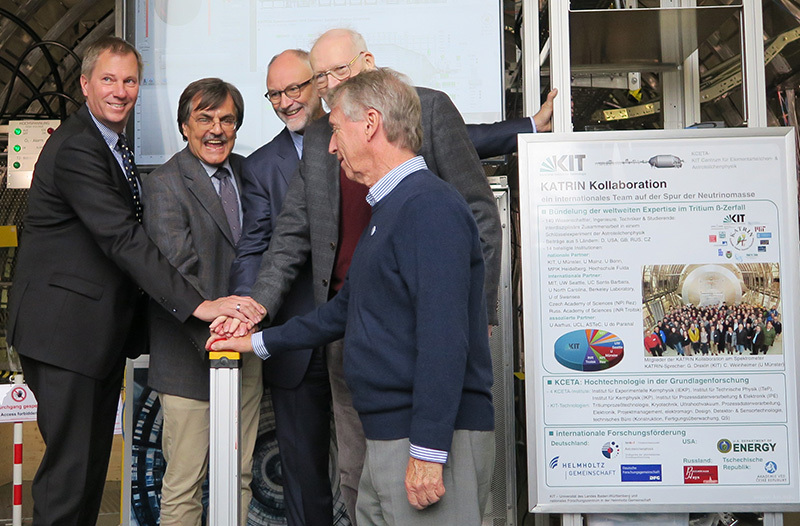 In the past years, the KATRIN collaboration has solved numerous scientific challenges and entered new technological fields in order to cope with the century's task of measuring the neutrino mass. For example, to maintain a high voltage of 18,600 volts with an accuracy of 0.01 volts stable. Or the production of an ultra-high vacuum, which corresponds to the one on the moon surface, in a world-wide turn-around world record volume of 1,240 cubic meters. About 150 scientists from 6 countries and 18 renowned institutions are involved in the KATRIN experiment, whose budget is 60 million euros. The measurement of the neutrino mass using Tritium is scheduled to start in Fall 2017. The final planned sensitivity for the KATRIN experiment will be reached after five calendar year measurement time.However, first interesting results are already expected for mid-2018. 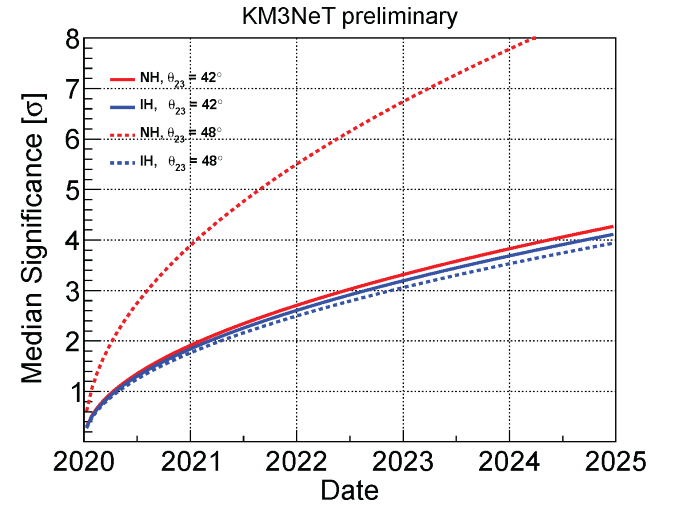 Then the measurement sensitivity of KATRIN will already be significantly better than this of all other Tritium decay experiments together over the last three decades. The KArlsruhe TRItium Neutrino (KATRIN) experiment, which is presently being assembled at Tritium Laboratory Karlsruhe on the KIT Campus North site, will investigate the most important open issue in neutrino physics: What is the absolute mass scale of neutrinos?. Two black holes spiral in toward one another and merge, emitting a burst of gravitational waves that LIGO can detect. 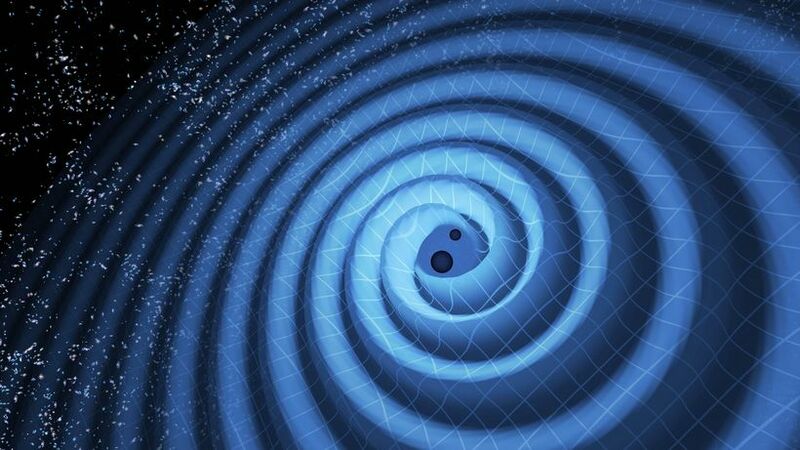 Scientists working at the twin LIGO instruments detected a second gravitational wave. The signal was recorded on December 26, 2015 the LIGO. It originates from a pair of merging black holes of about 14 and 8 solar masses – smaller than the ones detected on September 14 of last year. Researchers from the Max Planck Institute for Gravitational Physics in Potsdam and Hannover and the Leibniz Universität Hannover made significant contributions to the discovery in several key areas: the development of highly accurate gravitational-wave models, search methods to detect faint signals, determining their astrophysical parameters, and advanced detector technology. This second discovery proves that a new era of gravitational-wave astronomy has begun. 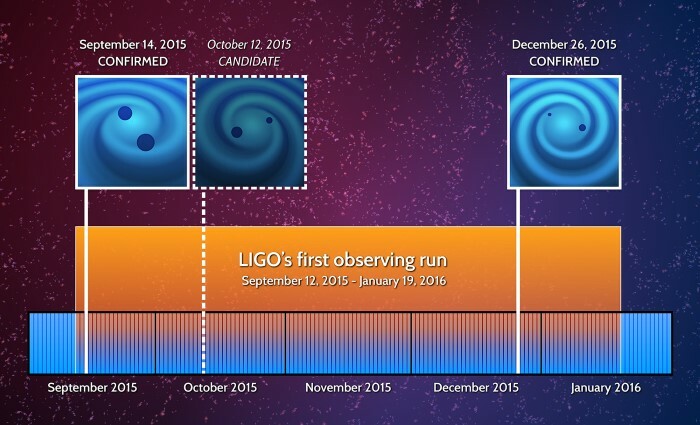 This illustration shows when the Ligo scientists have discovered gravitational waves. The event was much weaker than the first detection on September 14 and was buried in the detector noise. A so-called "matched-filter" search was essential for the detection. In such searches, the data are compared to or filtered with many predicted signals in order to find the best match. 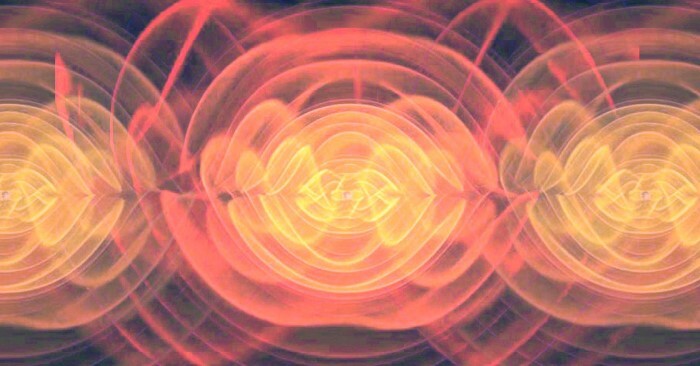 The predicted signals are based on highly accurate gravitational-wave models developed by scientists at the Max Planck Institute for Gravitational Physics (Albert Einstein Institute, AEI). It was thanks to these models that the LIGO science team was able to show that the signal was caused by the merger of two black holes. "It's fabulous that our waveform models have pulled out from the noise such a weak but incredibly valuable gravitational-wave signal," says Alessandra Buonanno, director at the AEI in Potsdam and professor at the University of Maryland. "GW151226 perfectly matches our theoretical predictions for how two black holes move around each other for several tens of orbits and ultimately merge. Remarkably, we could also infer that at least one of the two black holes in the binary was spinning!" After the initial detection of the signal, subsequent analyses, for which the AEI provided half of the computing power, revealed the astrophysical properties of the observed binary system. Most of the data analysis was performed on the Atlas supercomputer, the most powerful computer cluster in the world designed for gravitational-wave data analysis, which has contributed significantly more than any other system used by the LIGO and Virgo Collaborations. The results show that the observed system GW151226 consists of one black hole with about 14 times the mass of our Sun and one with about 8 solar masses. 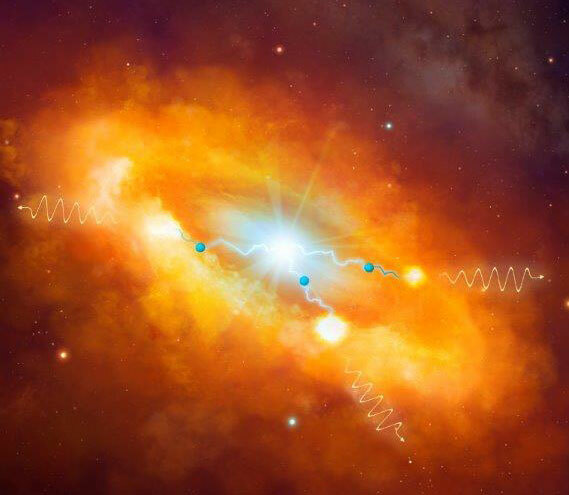 The two gravity traps merged at a distance of some 1.4 billion light-years from Earth. The researchers also found that at least one of the black holes spins on its axis. The merger emitted the equivalent of about 1 solar mass in gravitational wave energy and left behind a rotating 21 solar mass black hole. The two black holes have merged into a single hole with 21 solar masses. The colours reflect different gravitational fields, with cyan signifying weak, and orange signifying strong fields. Scientists within the Simulating eXtreme Spacetime collaboration have corroborated this scenario by running numerical-relativity simulations with parameters close to GW151226. These were in excellent agreement over the entire signal with the waveform models mentioned above used to infer the astrophysical properties of the source, further verifying that GW151226 was generated by the collision of two stellar-mass black holes in General Relativity. The signal, extracted from the detector noise, differs in several key aspects from the first detected signal. Because of the smaller masses, the signal was registered by the instruments for a longer time, about 1 second - 27 orbits of the black holes before merger. For the first detection on September 14, 2015 (GW150914), only the last five orbits were observable. During the one second mentioned, the gravitational wave increased in frequency from 35 Hz to 430 Hz. The signal's peak strain amplitude of about 3×10-22 made it about three times weaker than the first detection. "Now even the skeptics have to admit that our first detection was not a fluke," says Bruce Allen, Managing Director of the Max Planck Institute for Gravitational Physics in Hannover. "I am now totally confident that in the next few years we will detect dozens of similar black hole mergers, and learn a lot about the universe. It is very satisfying to see that the data analysis methods we have invented in the past twenty years work as well as we had hoped." "With this second observation we truly are on the path to genuine gravitational-wave astronomy. We can start to explore the variety of sources on the unknown dark side of the Universe," says Karsten Danzmann, director at the AEI in Hannover and director of the Institute for Gravitational Physics at LUH. "After so many years of research, development, and preparation it is very satisfying to see our vision finally come true." Advanced LIGO’s (aLIGO) next data-taking run "O2" will begin this fall and is expected to last for about six months. By then, further improvements in detector sensitivity should allow LIGO to reach as much as 1.5 to 2 times more of the volume of the universe. The GEO600 gravitational-wave detector will also take part in the observation run. The Virgo detector is expected to join in the latter half of the O2 run. 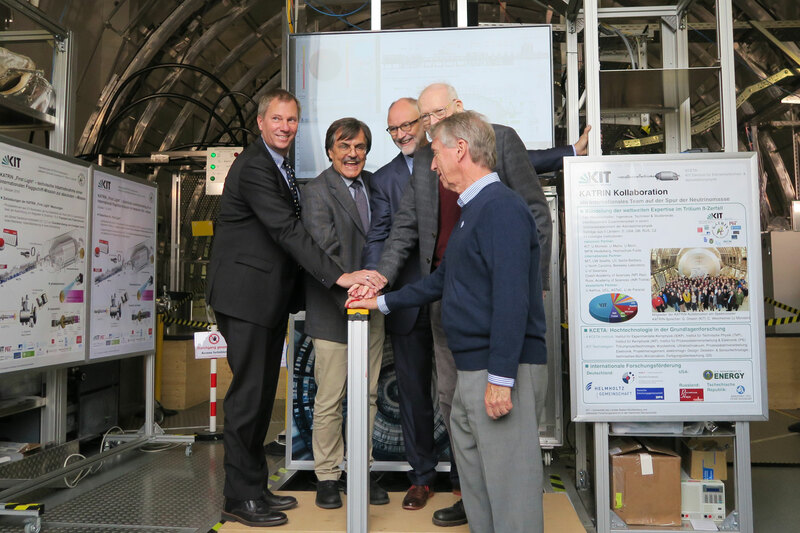 A major international project in gamma-ray astronomy, the Cherenkov Telescope Array (CTA), has taken another important step towards becoming a reality. At today’s meeting in Munich, the shareholders’ meeting of the company CTAO GmbH decided that the Science Data Management Centre and the seat of the CTA Scientific Director should be located at the DESY research centre in Zeuthen. At the same time, it decided that the administrative headquarters of the CTA organisation would be in Bologna, Italy. "We are very pleased that we have won the international bid and managed to bring the scientific coordination of CTA to Germany," says Beatrix Vierkorn-Rudolph of Germany’s Ministry of Education and Research, who is the deputy chairperson of the CTAO’s shareholders’ meeting. The Cherenkov Telescope Array is a project that seeks to build an observatory for conducting gamma-ray astronomy, unlike any other in the world. The observatory will consist of more than 100 individual telescopes located at a site in the southern hemisphere and another site in the northern hemisphere. Over 1,000 scientists and engineers from more than 30 different countries have joined forces to set up the facility over the next five years and to operate it for at least 20 years. Negotiations are currently underway concerning the sites in Chile and on La Palma and are due to be completed by the end of this year. The project will cost some 400 million euros and is part of the Federal Ministry of Education and Research’s national roadmap for future research infrastructures, as well as its European counterpart, the ESFRI roadmap. "Germany has a long and successful tradition in the field of gamma-ray astronomy, which we can put to excellent use in the scientific coordination of CTA," explains Werner Hofmann of the Max Planck Institute for Nuclear Physics in Heidelberg, who is spokesman for the international CTA Consortium and founding director of CTAO GmbH. "CTA is going to revolutionise this field of astronomy. We are expecting CTA to provide profound insights into the role of high-energy processes in the development of the universe and many scientific surprises." 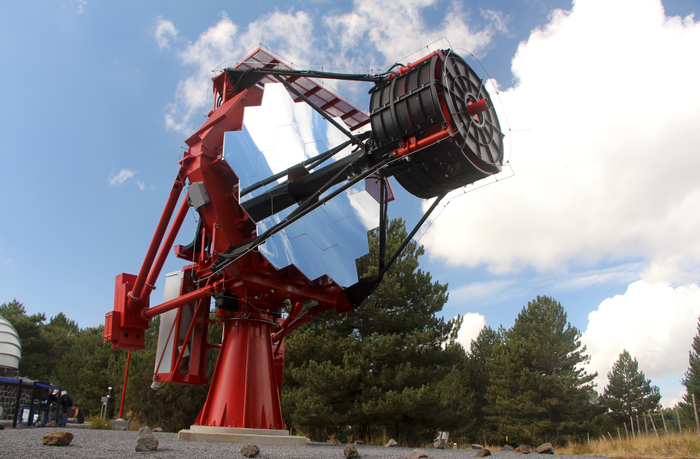 The proposals for observations put forward by scientists from all over the world will be collected in Zeuthen, under the management of the CTA Scientific Director, and prepared for future measurement campaigns of the telescope array, and the data from the observations will be processed here and then made available to the research community. Scientists at DESY have for many years been carrying out research in the field of gamma-ray and neutrino astronomy, collaborating closely with the surrounding universities and research institutions in the Berlin-Brandenburg region. 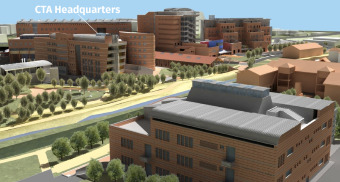 This makes it the ideal scientific setting for the Science Data Management Centre of CTA. "This is a great day for German astroparticle physics, and also for the Zeuthen region as a whole," says Christian Stegmann, head of DESY’s Zeuthen site. "The decision will be a long-term incentive for the Berlin-Brandenburg region, which is already firmly established in the field of astronomy and astrophysics in Germany. We would like to thank CTAO GmbH for the trust it is placing in DESY." 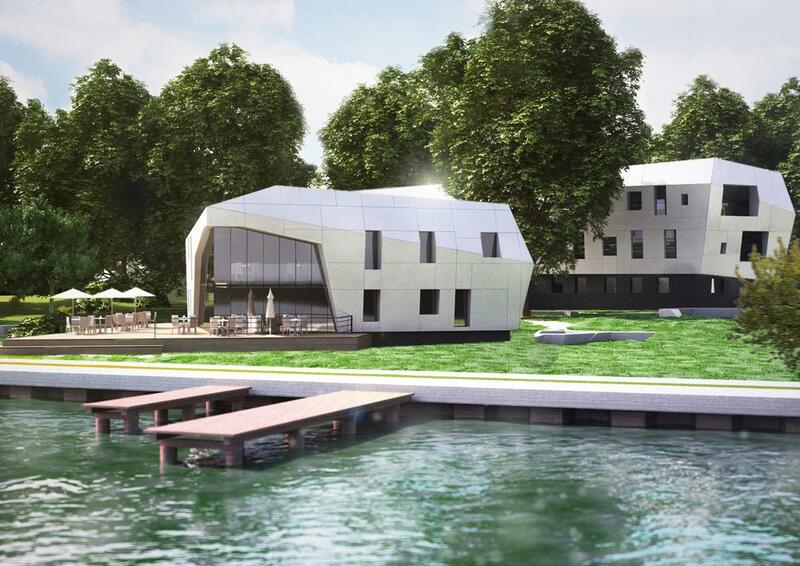 A new building is to be erected for the Science Data Management Centre at the DESY Campus on Lake Zeuthen. It will operate in close coordination with the existing centre, making use of available synergies. 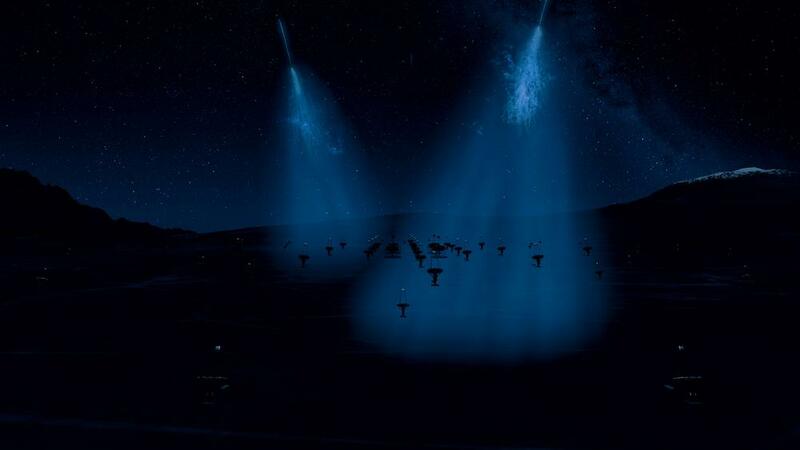 "Before long, the excavators will be arriving at the DESY Campus in Zeuthen, and further down the line the CTA researchers at Lake Zeuthen will use gamma radiation to study how, deep inside the universe, shock waves from huge stellar explosions plough their way through our Milky Way," remarks Stegmann, "or how matter is carried off by huge maelstroms in the neighbourhood of black holes." The Selection Committee of the Breakthrough Prize in Fundamental Physics today announced a Special Breakthrough Prize in Fundamental Physics recognizing scientists and engineers contributing to the momentous detection of gravitational waves – a detection announced on February 11, 2016. The Special Breakthrough Prize can be conferred at any time in recognition of an extraordinary scientific achievement. The $3 million award will be shared between two groups of laureates: the three founders of the Laser Interferometer Gravitational-Wave Observatory (LIGO), Ronald W. P. Drever (Caltech), Kip S. Thorne (Caltech) and Rainer Weiss (MIT), who will each equally share $1 million; and 1012 contributors to the experiment, who will each equally share $2 million. 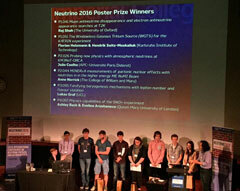 The contributors sharing the prize include 1005 authors of the paper describing the discovery of gravitational waves from the numerous institutions involved in LIGO and its sister experiment, the Virgo Collaboration. Also sharing the prize are seven scientists who made important contributions to the success of LIGO. Stephen Hawking, who won the Special Breakthrough Prize in 2013, said, "This discovery has huge significance: firstly, as evidence for general relativity and its predictions of black hole interactions, and secondly as the beginning of a new astronomy that will reveal the universe through a different medium. The LIGO team richly deserves the Special Breakthrough Prize." The laureates will be recognized at the 2017 Breakthrough Prize ceremony in the fall of 2016, where the annual Breakthrough Prize in Fundamental Physics (distinct from the special prize) will also be presented, along with the Breakthrough Prizes in Life Sciences and Mathematics. the brightest blazar in this part of the sky. Fermi LAT images showing the gamma-ray sky around the blazar PKS B1424-418. 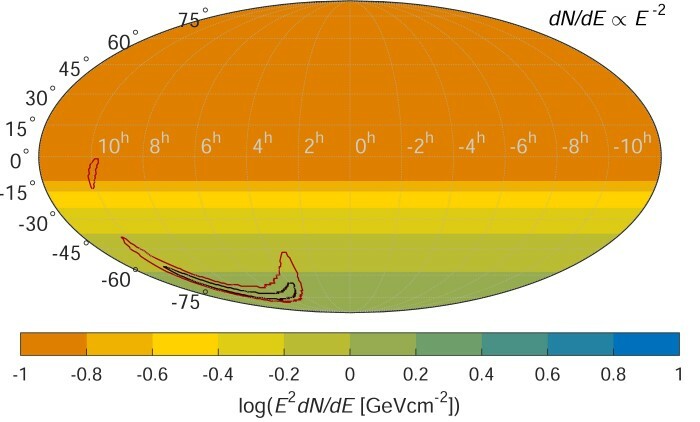 source region established by IceCube for the Big Bird neutrino (50-percent confidence level). Although neutrinos far outnumber all the atoms in the universe, they rarely interact with matter, which makes detecting them quite a challenge. But this same property lets neutrinos make a fast exit from places where light cannot easily escape -- such as the core of a collapsing star - and zip across the universe almost completely unimpeded. Neutrinos can provide information about processes and environments that simply aren't available through a study of light alone. Recently, the IceCube Neutrino Observatory at the South Pole found first evidence for a flux of extraterrestrial neutrinos, which was named the Physics World breakthrough of the year 2013. To date, the science team of IceCube Neutrino has announced about a hundred very high-energy neutrinos and nicknamed the most extreme events after characters on the children's TV series "Sesame Street." On Dec. 4, 2012, IceCube detected an event known as Big Bird, a neutrino with an energy exceeding 2 quadrillion electron volts (PeV). To put that in perspective, it's more than a million million times greater than the energy of a dental X-ray packed into a single particle thought to possess less than a millionth the mass of an electron. Big Bird was the highest-energy neutrino ever detected at the time and still ranks second. Where did it come from? The best IceCube position only narrowed the source to a patch of the southern sky about 32 degrees across, equivalent to the apparent size of 64 full moons. "It’s like a crime scene investigation", says lead author Matthias Kadler, a professor of astrophysics at the University of Würzburg in Germany, "The case involves an explosion, a suspect, and various pieces of circumstantial evidence." TANAMI. Since 2007, TANAMI has routinely monitored nearly 100 active galaxies in the southern sky, including many flaring sources detected by Fermi. 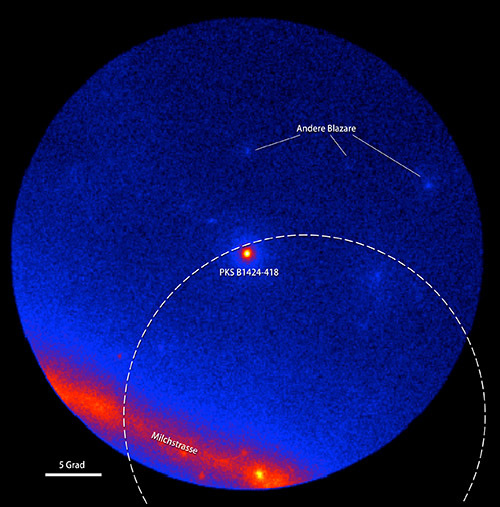 Three radio observations between 2011 and 2013 cover the period of the Fermi outburst. They reveal that the core of the galaxy's jet had been brightening by about four times. No other galaxy observed by TANAMI over the life of the program has exhibited such a dramatic change. "Within their jets, blazars are capable of accelerating protons to relativistic energies. 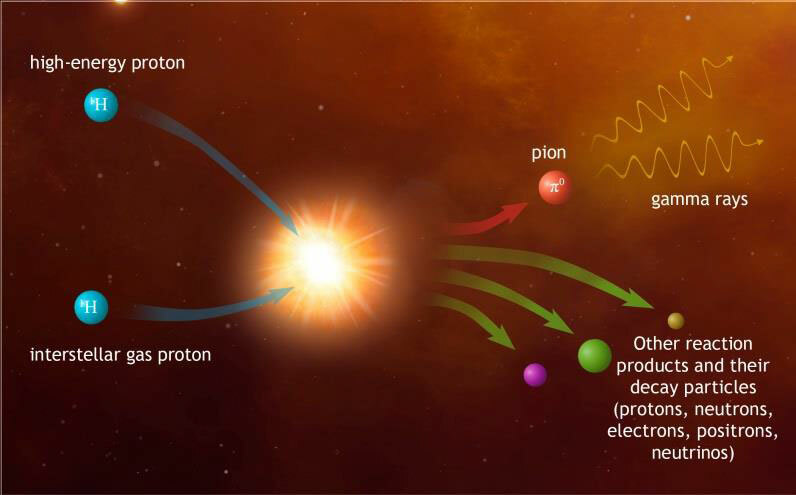 Interactions of these protons with light in the central regions of the blazar can create pions. When these pions decay, both gamma rays and neutrinos are produced," explains Karl Mannheim, a coauthor of the study and astronomy professor in Würzburg, Germany. "We combed through the field where Big Bird must have originated looking for astrophysical objects capable of producing high-energy particles and light," adds coauthor Felicia Krauß, a doctoral student at the University of Erlangen-Nürnberg in Germany. "There was a moment of wonder and awe when we realized that the most dramatic outburst we had ever seen in a blazar happened in just the right place at just the right time." "Taking into account all of the observations, the blazar seems to have had means, motive and opportunity to fire off the Big Bird neutrino, which makes it our prime suspect," explains Matthias Kadler. Francis Halzen, the principal investigator of IceCube at the University of Wisconsin–Madison, and not involved in this study, thinks the result is an exciting hint of things to come. "IceCube is about to send out real-time alerts when it records a neutrino that can be localized to an area a little more than half a degree across, or slightly larger than the apparent size of a full moon," he concludes. "We're slowly opening a neutrino window onto the cosmos." The Tracking Active Galactic Nuclei with Austral Milliarcsecond Interferometry (TANAMI) is a multiwavelength monitoring program of active galaxies in the Southern sky. It includes regular radio observations using the Australian Long Baseline Array (LBA) and associated telescopes in Chile, South Africa, New Zealand and Antarctica. When networked together, they operate as a single radio telescope more than 6,000 miles across and provide a unique high-resolution look into the jets of active galaxies. Scientists of the H.E.S.S. Observatory have identified an area around the black hole in the centre of the Milky Way that emits intense gamma radiation of extremely high energy. The source of the radiation is an astrophysical accelerator speeding up protons to energies of up to one peta electronvolts (PeV) – more than 100 times higher than the largest and most powerful man-made particle accelerator, the Large Hadron Collider LHC at CERN. The scientists have now published their detailed analysis of recent H.E.S.S. data in the scientific journal Nature. The analysis shows the first identification of a source of cosmic rays with peta-electronvolt energy within the Milky Way: it is very likely the supermassive black hole at the centre of our galaxy itself. For more than 10 years, H.E.S.S. (High Energy Stereoscopic System), a gamma ray telescope in Namibia which is operated by 150 scientists from 12 countries, has mapped the centre of the Milky Way in highest energy gamma rays. The gamma rays observed by the researchers are produced by so-called cosmic radiation – high-energy protons, electrons and atomic nuclei, which are accelerated in different places of the universe. Scientists have wondered about the astrophysical sources of this cosmic radiation since its discovery more than a century ago. The problem is that the particles are electrically charged and are therefore deflected in interstellar magnetic fields from their straight path. For this reason, their flight does not point back to its place of production. However, the particles of cosmic radiation often encounter interstellar gas or photons close to their source, producing high-energy gamma rays which reach the earth on a straight path. These gamma rays are used by the scientists of H.E.S.S. Observatory to make the sources of cosmic rays in the sky visible. produce neutral particles which decay immediately emitting gamma rays (yellow waves). When gamma rays hit the Earth's atmosphere, they produce short bluish flashes of light that can be detected by large mirror telescopes with fast light sensors at night. With this technique, more than 100 sources of high-energy gamma rays have been discovered in the sky over the past decades. Currently, H.E.S.S. is the most sensitive tool for their detection. It is known that cosmic radiation with energies up to about 100 tera electronvolts (TeV) is generated in the Milky Way. However theoretical arguments and the direct measurement of the cosmic radiation suggest that these particles should be accelerated in our galaxy up to energies of at least one peta electronvolt (PeV). In recent years, many extragalactic sources have been discovered that accelerate cosmic rays to multi-TeV energies, but the search for accelerators of the highest-energy cosmic rays in our galaxy remains unsuccessful so far. Detailed observations of the centre of the Milky Way, which were carried out with the H.E.S.S. telescopes during the past 10 years, now provide the first answers. "We have located an astrophysical accelerator accelerating protons to energies of up to one peta electronvolts, and that continuously over at least 1,000 years," says Prof. Christian Stegmann, head of DESY in Zeuthen and former spokesperson of the H.E.S.S. Collaboration. Very high-energetic gamma-ray image of the Galactic Centre region. Already during the first years of observation since 2002 H.E.S.S. had detected a strong compact source and an extended band of diffuse highest-energy gamma rays in the galactic centre. Evidence of this diffuse radiation, which covers an area of about 500 light years across, was already a clear indication of a source of cosmic rays in this region; proof of the source itself remained unfulfilled for the researchers. A significantly larger amount of observational data together with advances in analytical techniques have made it now possible to measure for the first time both the spatial distribution as well as the energy of the cosmic rays. Although the central region of our Milky Way hosts many objects that can generate high-energy cosmic rays, for instance a supernova remnant, a pulsar wind nebulae and a compact star clusters, the measurement of gamma rays from the galactic centre provides strong evidence that the supermassive black hole at the galactic centre itself accelerates protons to an energy of up to one PeV. "Our data show that the observed glow of gamma rays around the galactic centre is symmetrical," says H.E.S.S. researcher Stefan Klepser from Zeuthen. "The gamma rays are of a high energy and concentrated towards the centre, which suggests that they must be the echo of a huge particle accelerator which is located in the centre of this glow." Prof. Stegmann adds that "several possible acceleration regions can be considered, either in the immediate vicinity of the black hole, or further away, where a fraction of the material falling into the black hole is ejected back into the environment, potentially initiating the acceleration of particles." However, the analysis of the measurements also shows that this source alone cannot account for the total flux of cosmic rays detected on Earth. "If, however, our central black hole has been more active in the past", the researchers argue, "then it might actually be responsible for the entire bulk of today's galactic cosmic rays". If their assumption is correct, the 100-year-old mystery of the origin of cosmic rays would be solved. of the LOFAR telescope network near Exloo/Netherlands. LOFAR, the low-frequency array radio telescope, normally receives weak radio waves from the distant universe. But now and then an ultra-short, bright radio pulse is observed somewhere in between AM and FM radio frequencies. This radio blast would appear as a short cracking sound in your car radio. While usually ignored, this radio signal is actually the last SOS of an elementary particle entering the Earth atmosphere at almost the speed of light. The particles were fired off by a cosmic accelerator Millions of year ago. GLOW) have now unravelled the radio code of these intruders to determine their nature and constrain their origin. Supernova explosions, dying stars, black holes. All these phenomena have been named as sources of cosmic ray particles. But until now nobody really knows the origin. 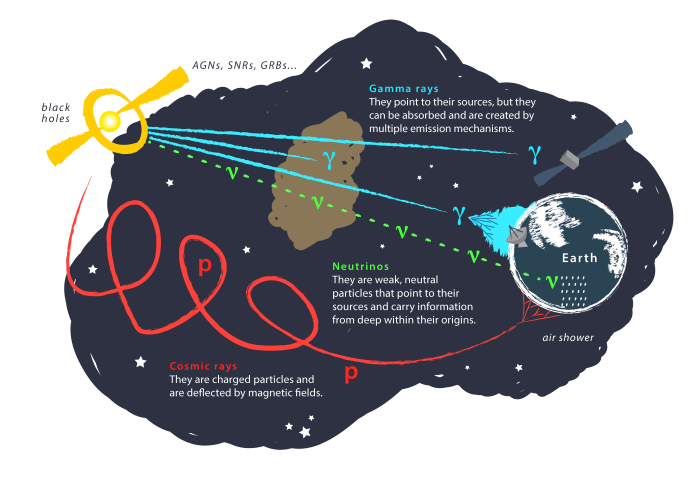 Cosmic ray particles are elementary particles that travel through the universe with an energy that is a million times bigger than in the largest particle accelerator on earth. With almost the speed of light, they collide like bullets with the atmosphere, before falling apart into a cascade of secondary particles. Their interaction with the Earth’s magnetic field leads to an extremely short radio signal, no longer than one billionth of a second. Thousands of LOFAR antennas help to find the signal and measure it accurately. Finding the signal is one thing, knowing what caused it is another. For the first time astronomers now succeeded in calculating and modelling what kind of particle came in. "We can now identify the bullet," says Heino Falcke from Radboud University in the Netherlands, the chair of the International LOFAR Telescope board who also pioneered this new technique. "In most cases the bullet turns out to be a single proton or the light nucleus of a helium atom." Nature paper. "But we think they come from a nearby source and get their energy from a cosmic accelerator in the Milky Way – perhaps a very massive star." The sources of cosmic particles are cosmic accelerators, up to a million times stronger than the Large Hadron Collider (LHC) in Geneva or any conceivable man-made accelerator for that matter. “These particles come to Earth anyway, so we only have to find them”, says Heino Falcke who is affiliated with the Max Planck Institute for Radio Astronomy (MPIfR) in Bonn, Germany. “We can now do high energy physics with simple FM radio antennas.” This opens up a new window to the high-energy universe and high-precision measurement of cosmic particles. "The main difference to ordinary FM radios is in the digital electronics and the broad-band receivers which allow us to measure a large number of frequencies simultaneously at high speed", explains Andreas Horneffer from MPIfR who built the antennas of a pre-cursor of the present experiment, LOPES ("LOFAR Prototype Experimental Station") as part of his PhD project. The particle identification from the radio measurements relies on exact knowledge of the radio emission physics. The LOFAR data are compared with simulations made with the CoREAS code developed by Tim Huege and his colleagues at Karlsruhe Institute of Technology (KIT) in the framework of the CORSIKA air shower simulation program. "When we started the radio signal simulations ten years ago and compared with data of our LOPES experiment, the physics of the radio emission was a big puzzle. Today, the simulations can reproduce even the high-quality LOFAR data in great detail, and could therefore be used to interpret the measurements with confidence." says Tim Huege. 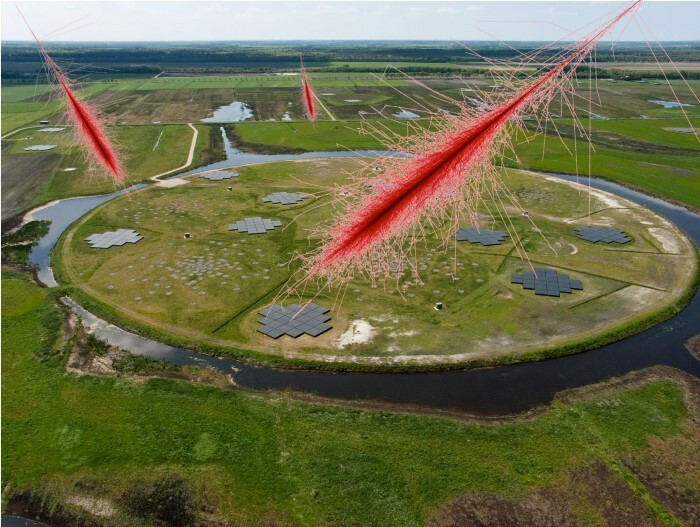 Cosmic ray detection with LOFAR has opened the door to precise measurements that help unravel the sources of these highest energy particles. The future Square Kilometre Array (SKA) with its very high density of antennas is expected to unleash the full potential of radio detection of cosmic rays with even higher measurement precision than achieved with LOFAR. "It is a remarkable experience having particle physicists and radio astronomers working together to realize such a successful experiment in the rising new field of astroparticle physics", concludes Ralf-Jürgen Dettmar from Ruhr-Universität Bochum, the chairman of the German GLOW consortium. The International LOFAR Telescope (ILT) was originally planned by ASTRONin the Netherlands, together with a number of European partner countries. 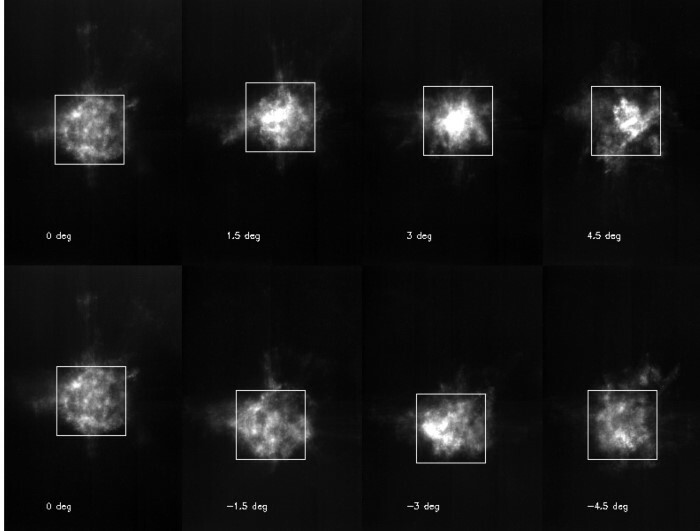 The LOFARtelescope network is made for radio observations in the meter wavelengths regime. At present it comprises 38 stations in the Netherlands, 6 stations in Germany, 3 in Poland and one each in the UK, Sweden and France. Each station consists of hundreds of dipole antennas which are electronically connected and thus form a virtual radio telescope across an area half the size of Europe. The German Long Wavelength Consortium (GLOW) was formed 2006 by German universities and research institutes to foster the use of the radio spectral window at meter wavelengths for astrophysical research. German researchers study for instance the evolution of galaxy clusters, magnetic fields in the intergalactic medium, the nature and evolution of pulsars, and solar outbursts. The detection of gravitational waves is an almost unprecedented success of fundamental science. It not only yields the one yet missing proof of Einstein’s Theory of General Relativity, but also opens a totally new observational window to the Universe. IceCube and ANTARES had the opportunity to check whether these two detectors had registered an excess of neutrinos coinciding in time with GW150914, i.e. with the signal reported by LIGO. A possible joint detection would have conveyed exciting astrophysical insight and could have been be used in targeted electromagnetic follow-up observations, given the significantly better angular resolution of neutrino events compared to gravitational waves. The investigations were performed on the basis of mutual agreements between the gravitational collaborations LIGO and Virgo on the one side and the two neutrino projects on the other. These agreements include strict confidentiality of the exchanged information. Knowing neither the significance of the LIGO signal nor its approximate position, the IceCube and Antares physicists selected data from a time window of ±500 seconds around GW150914. For IceCube, Thomas Kintscher from DESY in Zeuthen/Germany extracted the data from the stream of data reconstructed online directly at the South Pole and forwarded them to his colleagues Chad Finley from the University Stockholm and Imre Bartos from Columbia University, New York. These two performed the analysis, and only they did know about the approximate position derived from the gravitational data. Similarly, a small group of people acted on the ANTARES side, with Bruny Baret and Alexis Coleiro (both APC Paris) on the front line. Given the character of the source, the result was not totally unexpected: No coincident neutrinos were observed, neither by IceCube nor by ANTARES. The corresponding joint publication can be found at https://dcc.ligo.org/LIGO-P1500271/public. Resumé: A centennial success for gravitational physics, and a detective story of neutrino physics, which just started and will be continued for the following gravitational wave detections. 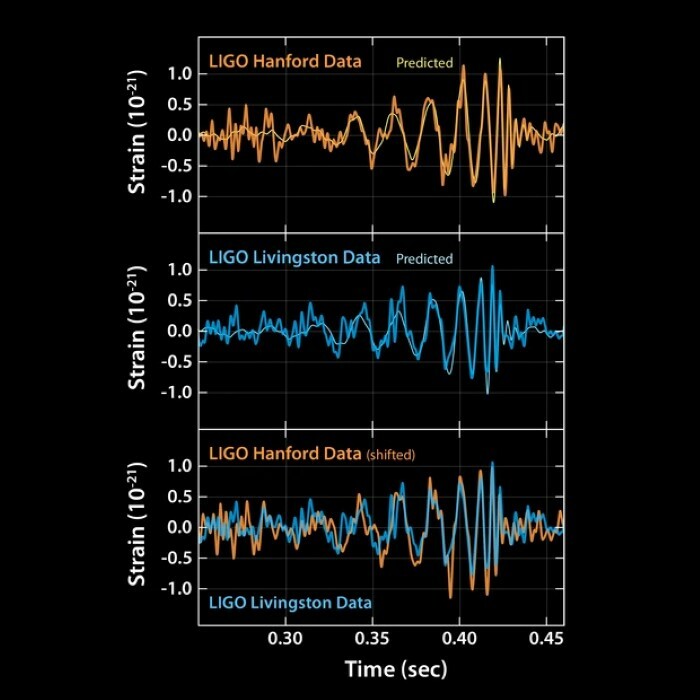 The gravitational wave signals detected by the twin LIGO stations. Researchers at the Max Planck Institute for Gravitational Physics (Albert Einstein Institute, AEI) in Hannover and Potsdam, Germany, and from the Institute for Gravitational Physics at Leibniz Universität Hannover (LUH) have made crucial contributions to the discovery in several key areas: development and operation of extremely sensitive detectors pushed to the limits of physics, efficient data analysis methods running on powerful computer clusters, and highly accurate waveform models to detect the signal and infer astrophysical information from it. "Scientists have been looking for gravitational waves for decades, but we’ve only now been able to achieve the incredibly precise technologies needed to pick up these very, very faint echoes from across the Universe," says Karsten Danzmann, director at the Max Planck Institute for Gravitational Physics in Hannover and director of the Institute for Gravitational Physics at Leibniz Universität Hannover. "This discovery would not have been possible without the efforts and the technologies developed by the Max Planck, Leibniz Universität, and UK scientists working in the GEO collaboration." "I am proud that the first two scientists to look at the signal were at the Max Planck Institute for Gravitational Physics and that our institute played a leading role in this exciting discovery," says Bruce Allen, director at the Max Planck Institute for Gravitational Physics in Hannover. "Einstein himself thought gravitational waves were too weak to detect, and didn’t believe in black holes. But I don’t think he’d have minded being wrong!" "We spent years modeling the gravitational-wave emission from one of the most extreme events in the Universe: pairs of massive black holes orbiting with each other and then merging. And that’s exactly the kind of signal we detected!" says Alessandra Buonanno, director at the Max Planck Institute for Gravitational Physics in Potsdam. "It is overwhelming to see how exactly Einstein’s theory of relativity describes reality. 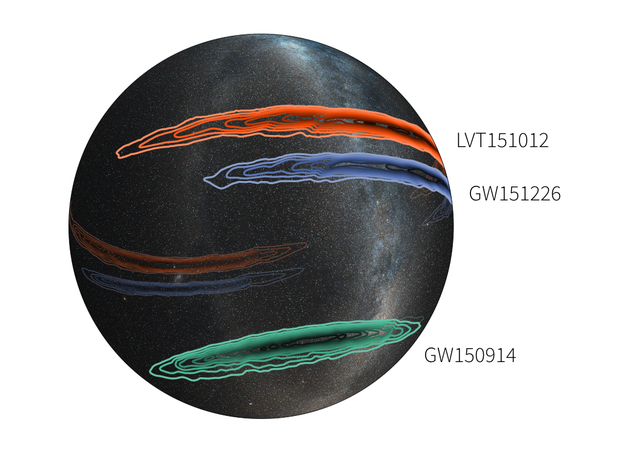 GW150914 gives us a remarkable opportunity to see how gravity operates under some of the most extreme conditions possible." 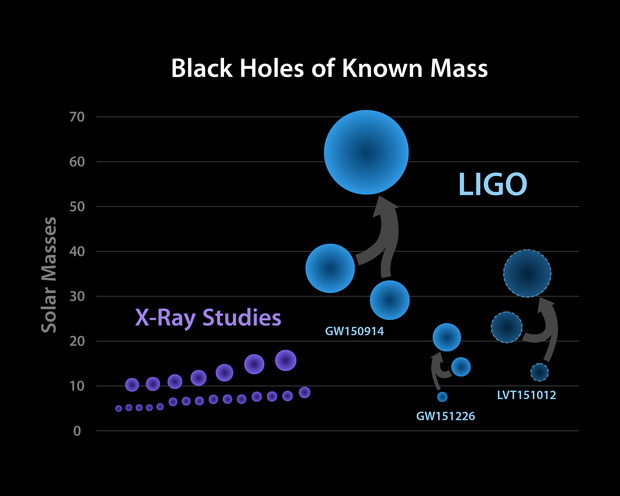 LIGO research is carried out by the LIGO Scientific Collaboration ( LSC), a group of more than 1,000 scientists from universities around the United States and in 14 other countries. More than 90 universities and research institutes in the LSC develop detector technology and analyze data; approximately 250 students are strong contributing members of the collaboration. The LSC detector network includes the LIGO interferometers and the GEO600 detector. 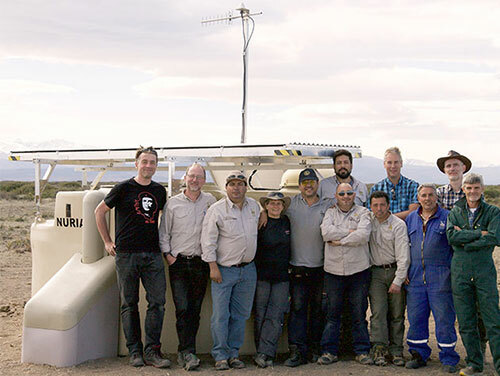 The GEO team includes scientists at the Max Planck Institute for Gravitational Physics (Albert Einstein Institute, AEI), Leibniz Universität Hannover (LUH), along with partners at the University of Glasgow, Cardiff University, the University of Birmingham, other universities in the United Kingdom, and the University of the Balearic Islands in Spain. The discovery was made possible by the enhanced capabilities of Advanced LIGO (aLIGO), a major upgrade that increases the sensitivity of the instruments compared to the first generation LIGO detectors, enabling a large increase in the volume of the universe probed – and the discovery of gravitational waves during its first observation run. The US National Science Foundation leads in financial support for Advanced LIGO. Funding organizations in Germany (Max Planck Society), the U.K. (Science and Technology Facilities Council, STFC) and Australia (Australian Research Council) also have made significant commitments to the project. Several of the key technologies that made Advanced LIGO so much more sensitive have been developed and tested by the German UK GEO collaboration. Significant computer resources have been contributed by the AEI Hannover Atlas Cluster, the LIGO Laboratory, Syracuse University, and the University of Wisconsin-Milwaukee.